A CRPF vehicle suffered slight damage when a private car exploded after one of its gas cylinders caught fire on the Jammu-Srinagar national highway on Saturday, police said. There were no casualties in the incident that occurred near the Jawahar Tunnel in Jammu and Kashmir’s Ramban district around 10.30 am. The incident triggered memories of the February 14 vehicle-borne suicide attack on a Central Reserve Police Force (CRPF) convoy in Pulwama that claimed the lives of 40 personnel. 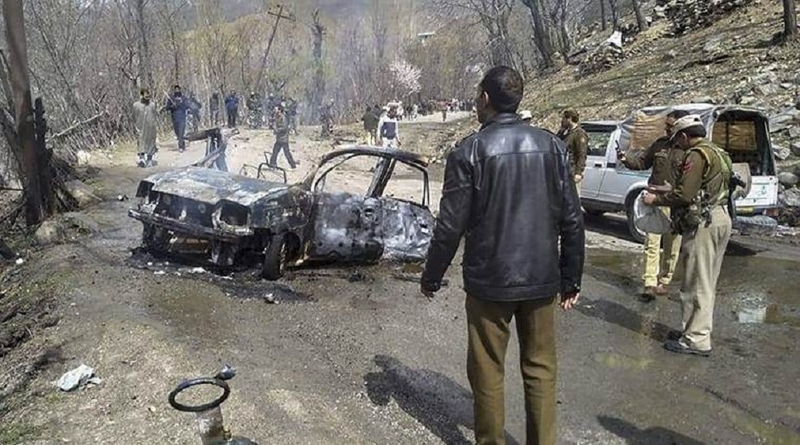 According to a preliminary investigation, the blast near Tethar village, seven km from Banihal town in Jammu region, occurred after one of the two gas cylinders in the Hyundai Santro model caught fire. Banihal sub-divisional police officer Sajad Sarwar said the vehicle, which was on the way to Jammu from Srinagar was completely gutted in the fire. A CRPF vehicle, which was passing through the highway at the time of the incident, suffered slight damages in the rear side, but all the personnel on board escaped unhurt, Sarwar said. Around 10 vehicles were reported to be part of the convoy. “Another gas cylinder was found lying near the vehicle but no explosive substance was found,” the officer said, but did not ruled out a terror angle. The driver of the private car remained untraced and is believed to have escaped the scene after his vehicle caught fire, he said. “It has not been established whether it was a (terror) attack or not. It has also not been established why the vehicle caught fire,” Governor Satya Pal Malik told reporters in Jammu. “No explosive of sorts, but nothing can be said (at the moment).” The officer said the police had started an investigation and forensic experts have also been summoned to help the investigation. “Efforts are also on to identify the driver of the vehicle for questioning,” he said.